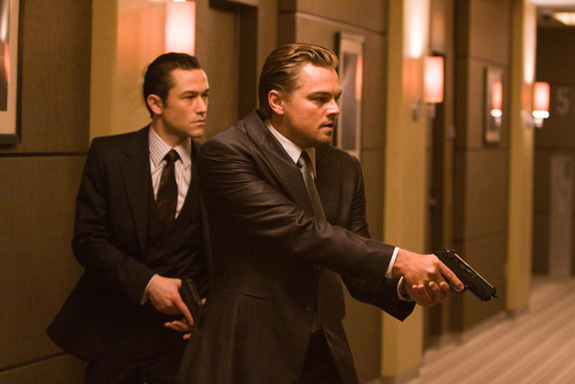 This three disc release of Inception includes the Blu-ray movie, a Blu-ray disc of special features and a DVD version of the movie that also serves as a digital copy of the film and if you have never seen Inception before, get ready for the ride of your life. Christopher Nolan is undoubtedly one of the best filmmakers of the last decade. He has the rare ability of creating original and thought-provoking films respected by even the harshest of critics while also striking a chord with the general public – and making a fair amount of money to boot. After reinventing the super-hero genre with The Dark Knight, it looks like Nolan’s latest effort Inception is set to do the same thing with science fiction and it’s the best of his impressive catalogue of films. The video quality of Inception is amazing and dare I say reference material? Presented in 1080p/VC-1 encode (2:40:1), it really assists in bringing the story to life, thanks to the high resolution. The colours are vibrant, although sometimes muted in the dreamworld for a purpose and all the images are sharp & clear. Even the small things will stand out on the Blu-ray version and will leave you gobsmacked. Audio is equally as impressive with its DTS-HD Master Audio soundtrack that will definitely act as a reference for other movies. The audio is flawless and really makes good use of your surround sound system. This is how Blu-rays should be created. Then you have the special features which are almost as good as the feature itself. If you really want a behind the scenes pass to how the movie was created and more importantly, the dreamworld itself, than I suggest you watch all the special features. For me, the highlight was Dreams: Cinema of the Subconscious, a 40+ minute documentary into dreams itself and is not just a plug for the movie but has expert interviews about how our bodies manufacture dreams and how it is an integral part of our lives. 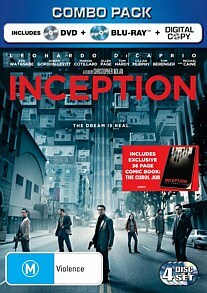 DVD copy of 'Inception' and Digital Copy for portable devices. Christopher Nolan's Inception is the 21st century Matrix and although shares some parallels, it's definitely a movie in its own right. The Blu-ray version of this movie does the story justice and will captivate you from start to finish. Nolan toys with us and forces us to question everything we’re seeing and hearing and leaves it so open that Inception is sure to be talked about for many years. This was by far one of the most enjoyable, exhilarating and engaging cinematic experiences I’ve ever had.